“Without our music, everything is lost” is the severest of warnings. Even more worrying in this documentary by Paul Chandler is the lack of any real encouragement that current trends can be reversed. I was drawn to this movie because I love the music of one of Mali’s greatest sons, Ali Farka Touré, and DIFF also hosted one of the best movies of the current century, Timbuktu (2014), which portrayed, among other things, the threat that militant Islam posed to Mali’s musical culture. This documentary doesn’t remotely belong in the same category of achievement as Abderrahmane Sissako’s masterpiece, but it does represent a useful reminder that Mali’s traditional music, which is an essential component of its culture, remains under threat. 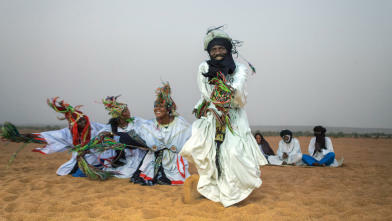 The film is narrated by one of the late Touré’s fellow musicians, Afel Bocoum, who notes not only the threat posed by religious extremism – with jihadist invaders from the north banning music – but also concerns that modernity in its many guises, including economic and cultural globalisation, is putting the increasingly poor nation’s traditional culture under severe pressure. Chandler took three years to film this movie in remote locations, documenting traditional cultural practices and interviewing musicians who could be among the last to play their unique instruments. The doccie points out that rap is already the most popular musical genre in the country, and that traditional music and some of the instruments it is played on are becoming endangered. If traditional music is Mali’s essential cultural glue, unifying the otherwise disparate nation, the worry remains as to how long it can continue to play this role. One mild disappointment is the quality of some of the film’s sound recordings. Whilst the footage of the various cultural practices is vivid enough, the accompanying music is not as clear or as loud as it should have been.